Grapes (particularly red grapes) have immense health and beauty benefits because they are packed with antioxidants like flavonoid, resveratrol, and tannin. Thus, they fight free radicals and help maintain youthful and glowing skin. Plus, they are rich in amino acids that assist in skin renewal. In addition, grapes protect against sun damage when applied on skin. They improve the elasticity of skin and prevent wrinkles. Besides, this fruit works as a perfect cleanser for dry, oily as well as normal skin. It is loaded with alpha hydroxyl acids that help cure acne. Moreover, it contains vitamin A, vitamin B-complex, vitamin C, vitamin K, potassium, magnesium, calcium, phosphorus, iron, manganese, and so on. When using grapes for skin-care recipes, you can either use mashed grapes or grape juice. 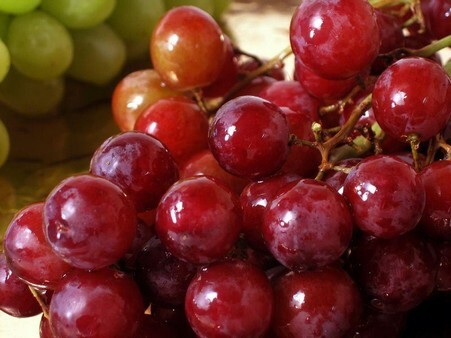 Furthermore, you can consume grapes and grape seed extract for maintaining healthy skin and promoting hair growth. • Prepare an anti-aging face mask at home by adding one tablespoon of orange juice and three tablespoons of plain yogurt in two to three tablespoons of grape juice. Leave this solution on your face and neck for about five minutes and then, wash it off. • Add a few tablespoons of plain flour in a cup of mashed grapes (preferably red grapes). Spread this paste on your skin and wash it off after 15-20 minutes. Follow up with a toner and moisturizer to nourish and rejuvenate dull skin. • Blend a kiwi, two tablespoons of grape juice or grape fruit, and one tablespoon of organic honey in a blender or food processor. • To maintain clear skin and heal acne, apply a mixture prepared by adding a quarter teaspoon of wheat flour and a pinch of baking soda in four to five mashed grapes. Leave it on the skin for 10-15 minutes. Finally, rinse it off to get rid of pimples, blemishes, and other similar problems. This grape facial mask is excellent for oily skin. Here’s a video showing how to make a DIY detox mask with grapes. • Blend five to six grapes in a blender or food processor along with one tablespoon each of organic honey and grape seed oil until it has a smooth consistency. Apply this homemade beauty-care recipe on your skin, wash it off after 15 minutes, and follow up with a moisturizer to get soft, smooth, and radiant skin. Simply applying a combination of grapes and honey is good for treating acne naturally. It also exfoliates the skin and tightens the pores. • Another refreshing facial mask can be prepared by blending six grapes, two teaspoons of plain yogurt and half a teaspoon each of organic honey, lemon juice and olive oil. • Applying a combination of milk and grape juice is highly beneficial for dry skin. Rubbing a mixture of grape juice and yogurt is useful for healing sunburn. • Gently scrubbing mashed grapes on your skin can help keep it fresh and radiant. It also reduces wrinkles and fine lines. Besides, regularly consuming red, green, and black grapes prevents heart disease, strengthens the immune system, and protects against osteoporosis. This fruit also has anticancer properties. In addition, eating grapes can help maintain white teeth because the malic acid present in this fruit removes stains.